The New York City-based DJ and production duo 1Way TKT is putting the soul back in house music with the release of their single, “Evesdropping”. Featuring funky R&B vocals from British singer Shanaz Dorsett and J. Glaze’s sensual trumpet melodies, “Eavesdropping” stirs soul and deep house music together until each genre is indistinguishable from the other. Showcasing danceable clean percussion, bright piano, and a deliciously old school bass samples “Eavesdropping” provides the perfect foundation for Dorsett’s striking vocal delivery. 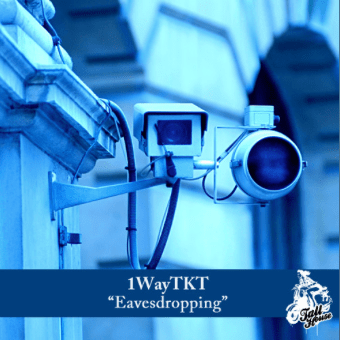 Quickly settling into a bouncy groove, “Eavesdropping” sits as deep in the pocket as a track can as it grabs listeners right by the eardrums. As Dorsett’s vocals loop over Glaze’s trumpet the song washes over listeners with a comfortable jaunt, letting the mind wander as it follows the catchy beat. Simultaneously hypnotic and bouncy, “Eavesdropping” brings listeners in with it’s chill vibe and easy sound before taking them on a dance journey that sticks in the brain and the bones. Listen to 1Way TKT and Shanaz Dorsett’s “Evesdropping” below. Stay in the loop by following 1Way TKT on Facebook, SoundCloud, and Twitter and grab the track from Beatport today. Whether I'm playing, listening, or dancing to music - that's typically how you'll find me. Graduate of the Kelley School of Business at Indiana University and a fresh transplant to sunny South Florida. Always searching for that perfect sound... For media, music, and press inquiries - please email me at info@thatdrop.com.